CP Cases announce the introduction of a new high performance Extruded Aluminium 19” rackmount chassis used inside ERack, Amazon Rack and SatRack products. Combining precision manufacturing techniques with innovative design, this new approach to producing rackmount chassis brings outstanding durability and performance during shock & vibration testing. Each element of the chassis employs multiple hollow triangular sections to achieve an extraordinary strength to weight ratio in comparison with other approaches to chassis manufacturing techniques. Utilising high-tensile tempered aluminium alloy, specifically selected for structural strength, in combination with stainless steel fixings provides significant benefits in increased stability & rigidity. 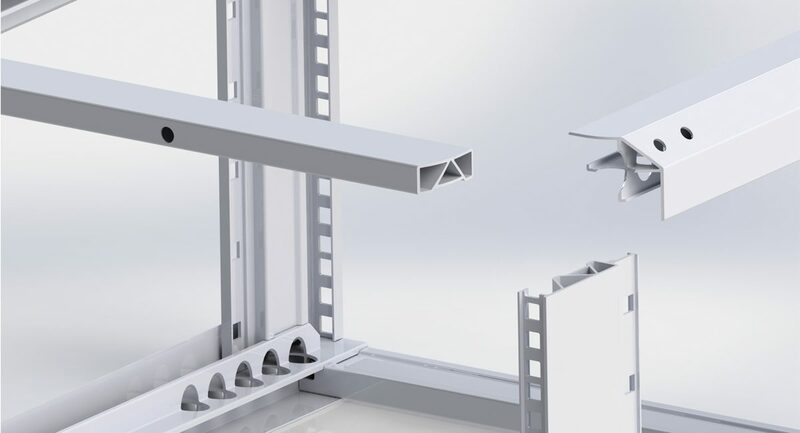 The extruded alloy profiles with high beam-strength, enable bigger payloads to be integrated into a rack enclosure without upgrading to a heavier steel construction. 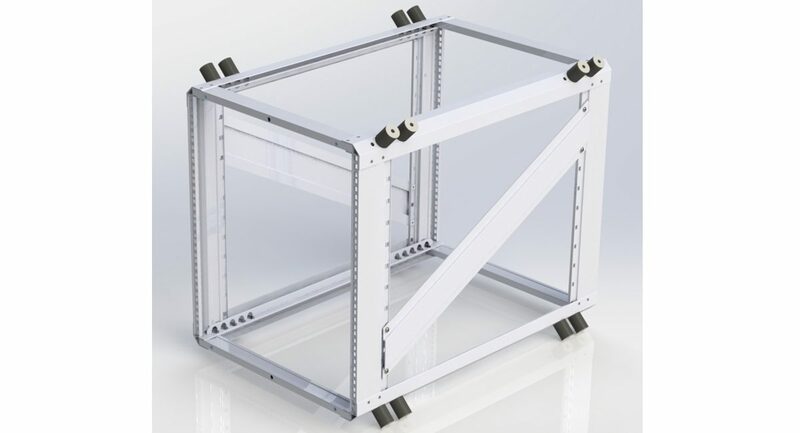 Managing the total weight of an enclosure minimises handling risks and reduces shipping costs. 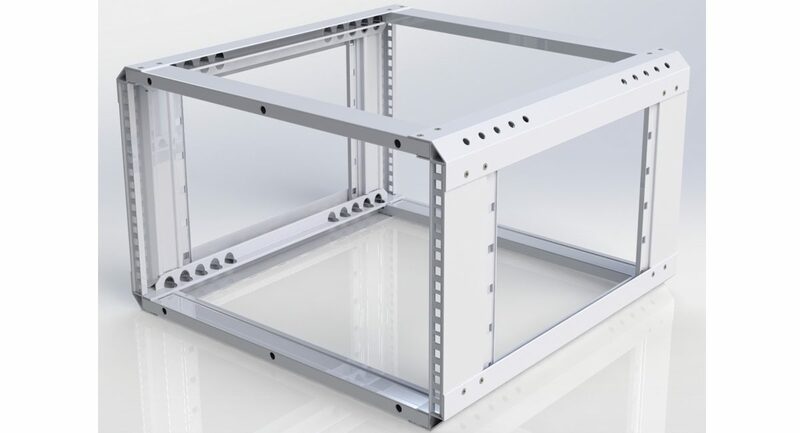 Stainless steel floating captive cage-nuts (M6 or 10-32 thread) can be easily installed by the user into the 9.5mm square holes, according to user requirements and are located in accordance with IEC 60297, the international standard for 19” structures. 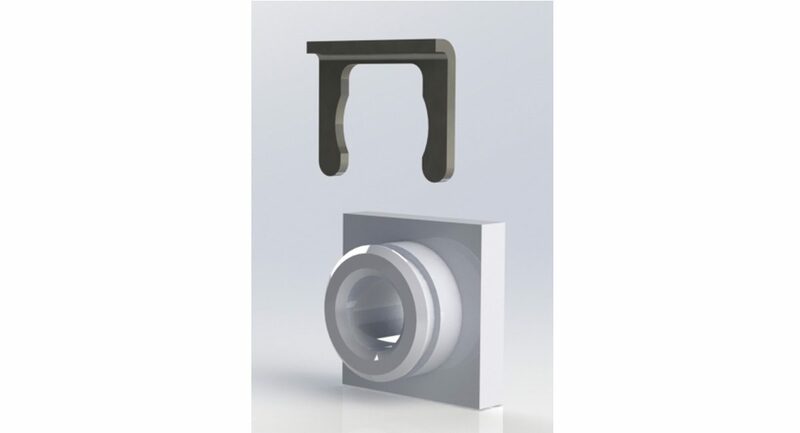 The radiused internal corners of the square cage-nut hole, provides great resistance to fatigue or crack propagation during particularly extreme vibration scenarios. The unique profile of the chassis vertical ‘cage-nut rails’ cleverly clamps the equipment’s 19” panel without crushing the cage-nut tabs upon the rear of the panel. SuperNut®, available as an optional extra, is a unique alternative to the conventional cage-nut, it also has ‘float’ and is available with M6 or 10-32 thread. Its key purpose is to provide increased resistance to becoming accidently dislodged during heavy-handed installation of equipment. Always in-stock sizes range from 2U to 18U in height and off-the-shelf options in depth are 350, 480, 610, 740 and 870mm. Non-standard U-heights, specific chassis depths or half-width sizes can be made available according to individual requests. Using the same shock absorbing elastomeric isolators as used in the first generation chassis’, CP Cases new Extruded Aluminium chassis has been successfully performance tested to highly demanding MIL-STD 810G levels. Working with industry leaders in product testing and certification; TUV SUD’s experts tested the chassis’ ability to function during and after the most challenging shock, vibration and transit scenarios. Amazon Rack & ERack enclosures were configured with 35kg and 65kg payloads to assess performance in laboratory test conditions. In-the-field performance of the new chassis was assured earlier this year when TUV issued certification to demonstrate the new chassis complied to MIL-STD-810G in Transit Drop, Random Vibration and Loose Cargo endurance testing.